Create classic horror movie inspired slideshows in Final Cut Pro X using Murder Upstairs theme package from Pixel Film Studios. 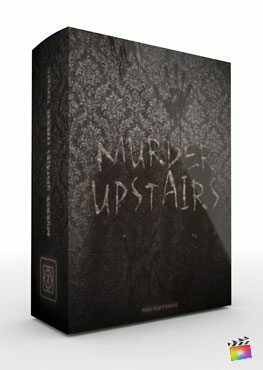 Murder Upstairs is a terrifying 3D environment that includes drop zones, fully-editable 3D text, and much more. Murder Upstairs also comes with transitions, lower thirds and a background tool. Create horrifying, movie-inspired photo and video slideshows in seconds using Murder Upstairs Cut Pro X.